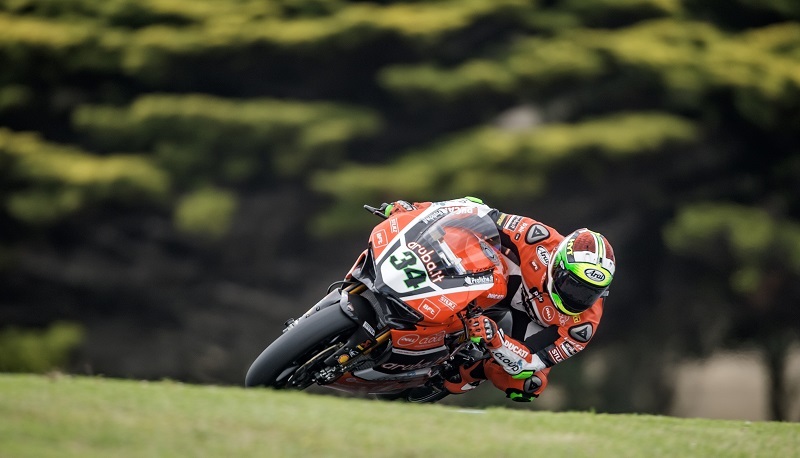 With a few days to go before the World Superbike 2016 season opener, the Aruba.it Racing – Ducati team took it to the track once again in Phillip Island (Australia) for the traditional, two-day test together with all the other teams and riders. Despite the warm temperatures, light rains hindered the team’s program, focused on consistency and competitiveness over the race distance in light of the latest upgrades to the engine, chassis and electronics of the Panigale R, which had already received a positive feedback in Portimão and Jerez last January. With the top riders separated only by a small margin, Chaz Davies (who crashed out without injuries in the final minutes) and Davide Giugliano closed in ninth and tenth position, respectively 0.581 and 0.713 seconds behind leader Tom Sykes, who posted a best lap of 1:31.097. The team will carry on with its program tomorrow, the second and final day of testing ahead of the first official practice sessions scheduled for Friday.